This weekend, as almost all others that have come before, seemed to end rather hastily leaving additional hours desired between the hands of the clock that rush us along reminding us of the constant countdowns to bedtime, to tomorrow, to the work day, to the unknown that lies ahead. 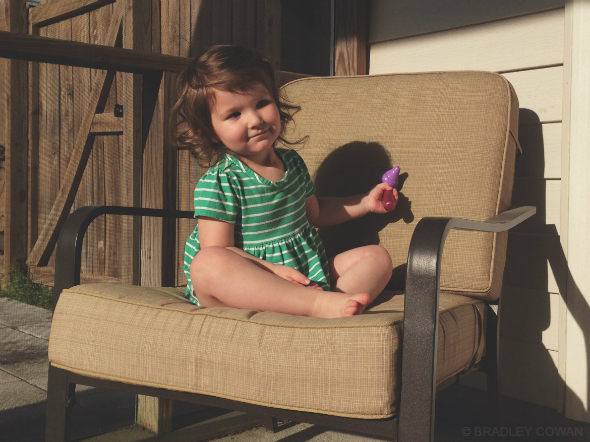 For a brief moment between the setting sun of Friday and its expected rise Monday morning, Madison sat and exclaimed she just wanted to sit for a little while. So I sat, too. For that brief moment, she caught her breath while I lost mine. Completely mesmerized by the amount of space she inhabits in my chest, the sheer volume of my daily thoughts that find themselves dedicated to her, the way her name seems to rest on the tip of my tongue threatening to initiate a conversation with her centered as the topic at any given moment, the happiness from within that holds my face hostage with a smile I’m often unaware has spread… I wanted that brief moment to last forever. Before the tears I knew would come, as they almost always do anytime I allow my heart the opportunity of speaking in unison with my head, before those tears crawled up from the deepest parts of me and threatened to run a parallel race down my face she climbed down from the chair she just settled into and the moment was over. Like witnessing a rare bird in the wild focusing on the wind under their wings until it pauses to rest and the perfection that lies under every feather is able to be seen for just a fraction of time, I’m constantly amazed by the person she is and promises to become. I have to remind myself to breathe in her presence because it’s unbelievably easy to forget the most simple of things in fear of losing the chance to soak in the beauty of life for I had no idea what it meant to really live until she entered mine, until she blessed me with her presence and the front row seat I’ve taken to witness her flight.